Mmmm, yes! I was at a Korean restaurant with James, the guy who’s been filming me lately for a documentary. I wanted to order a generic chicken dish, but he insisted on ordering for me and picked the meal that you see above. 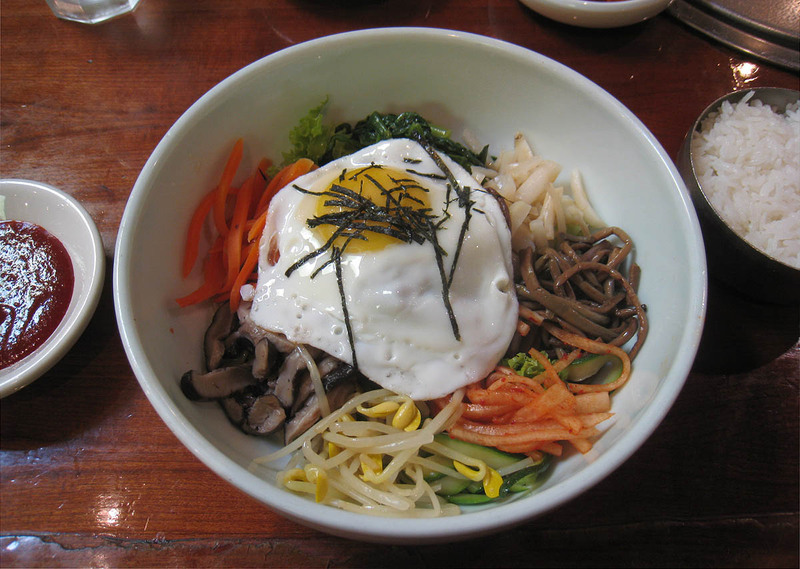 It was essentially a bowl of vegetables (carrots, lettuce, spinach, cabbage, cucumber, bean spouts, mushrooms, and other stuff that neither of us could identify) with a fried egg on top. (I picked out the mushrooms. I don’t do mushrooms. But I ate everything else.) James told me to dump the little bowl of rice on top and mix it all up. So I did. And it was surprisingly good. 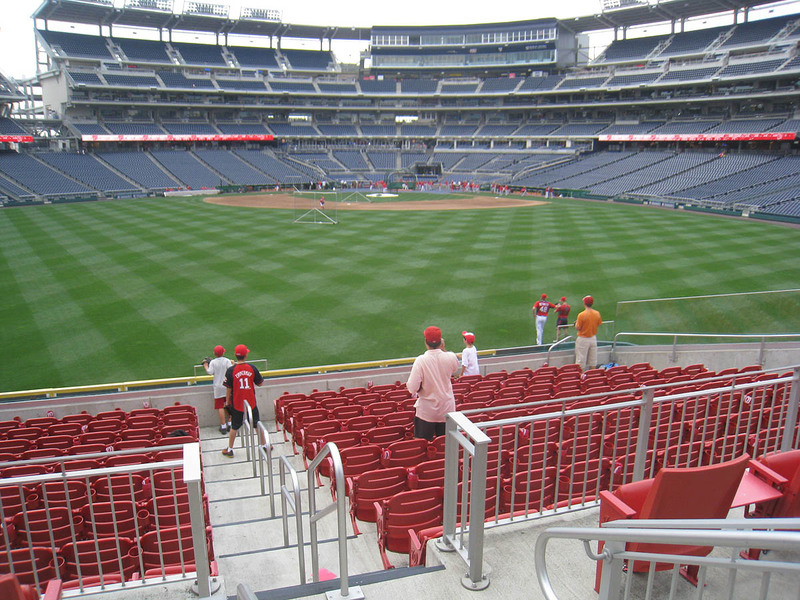 When the stadium opened at 4:30pm, I headed out to the Red Porch seats in left-center. Remember the security guard from the previous game who’d bashed me in the face while racing me for a ball? Well, he was back there, and as soon as he saw me, he shook his head as if to say, “YOU again.” He was 100 feet away from me when he did that — all the way down in the front row — and as I started making my way toward him, he tried to avoid me by heading up the steps on the far side of the section. That was the end of it, at least with him. I later got scolded by a middle-aged/fake-blonde waitress at the back of the section. For some reason, she felt it was her job to regulate how many baseballs I could snag, so after I got a few, she started yelling at me from 50 feet away — and I do mean YELLING. 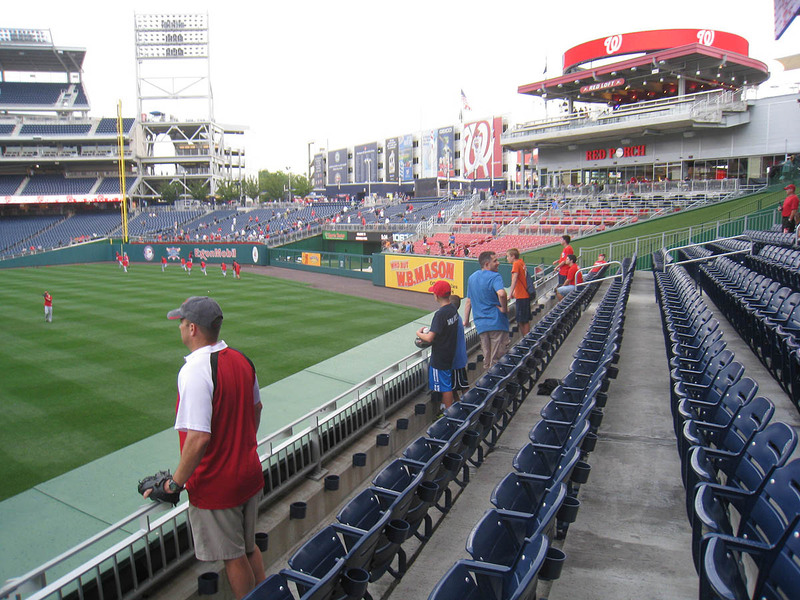 In the photo above, the kid in the red-and-black jersey snagged five balls — and those were just the ones that I saw. The other two kids down in front also got several balls apiece. In fact, by the time the waitress started nagging me, they’d already gotten a bunch of balls. Why was she so upset? The kids were in front. I was in back. They were getting toss-ups. I was chasing home runs. Everyone was happy. Some guy who was about 8-foot-30 eventually marched down the steps and stood right in front of me. 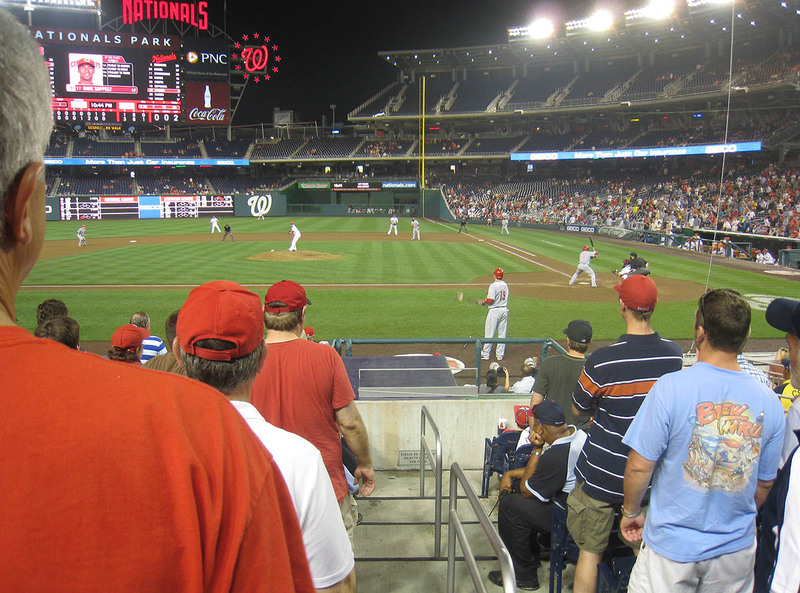 He was there to catch baseballs and, I gathered, to prevent me from catching any more. Well, after two home runs sailed directly over his glove and into mine, he decided to complain. He gave me a speech about how I was taking the joy out of it for everyone, and how I should give other people a chance, and blah blah blah, so I offered him a baseball. And he accepted it with a scowl on his face. And then he left. Within the next few minutes, I gave two more baseballs away — not because some lunatic waitress was demanding it, but because it seemed appropriate at the time. I handed one to a very little kid who had just wandered down to the front row, and I tossed the other to a grown man who’d had it knocked out of his glove by another fan. Of course the waitress didn’t notice. Just before the Nationals finished hitting, I used my glove trick to snag my 10th ball of the day from the gap behind the outfield wall. And then things went dead. …but there wasn’t a single home run that landed there. I didn’t snag a single baseball during the entire Reds’ portion of batting practice. I seriously have no idea what was going on, but I made up for it at the 3rd base dugout when BP concluded. Billy Hatcher tossed me a ball. 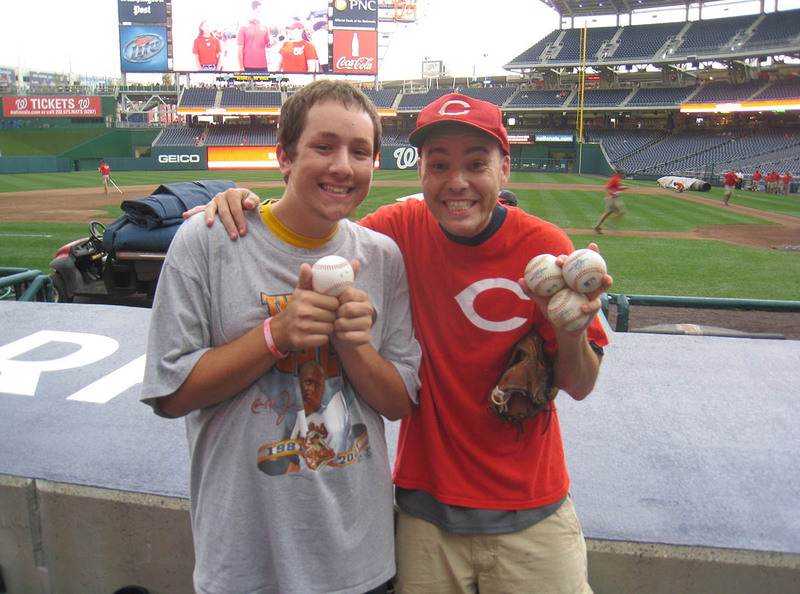 Then a ballboy (who hadn’t seen me get one from Hatcher) tossed one to me. And then some random Reds employee (who was dressed nicely and had some type of media credential dangling from his belt) tossed me another. The ballboy saw me get that one, so I shrugged. “Give it to kid,” he suggested politely. “I absolutely will,” I said. And I did. 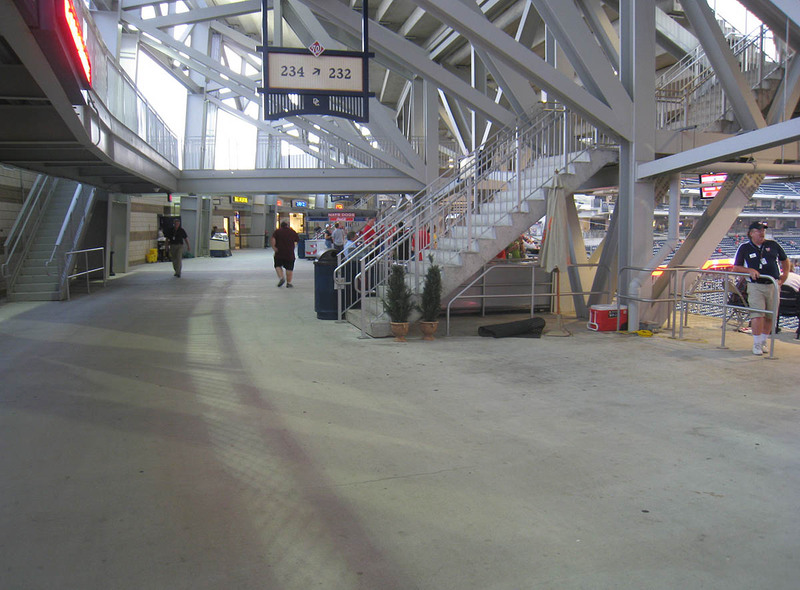 At the end of the night, when I was heading out of the stadium, I stood and waited in the concourse for several minutes until I saw a little kid with an empty glove. That’s who got the ball. 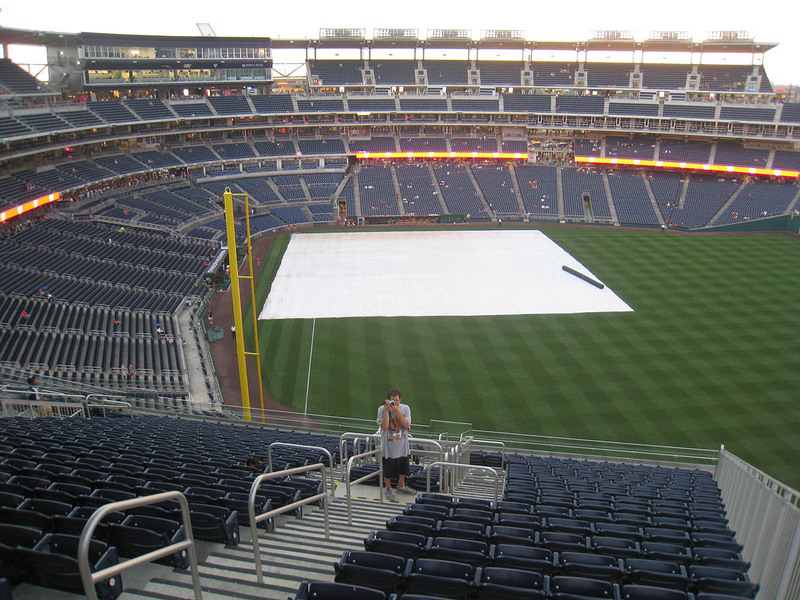 I would’ve given it away immediately, but when BP ended, it was starting to rain, so the seats were nearly empty. There were only two other kids behind the dugout, one of whom was the kid who’d gotten (at least) five balls in left-center field, and the other had just gotten a ball. Sometimes there are 1,000 kids and only a few dozen baseballs to go around. Yesterday it felt like those numbers were reversed. In the photo above, that’s me on the right (in case you can’t tell) and Avi Miller on the left. Avi is a regular at Camden Yards, and he’s awesome. ‘Nuff said. 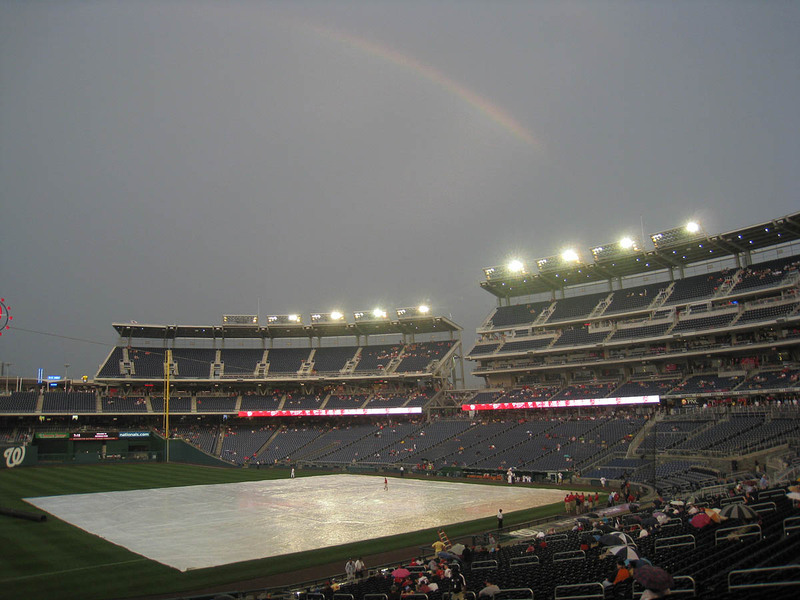 Do you remember when I was filmed by a local news station on 5/11/11 at Camden Yards? Well, in the photo above, the guy on the right is the one who put it all together. 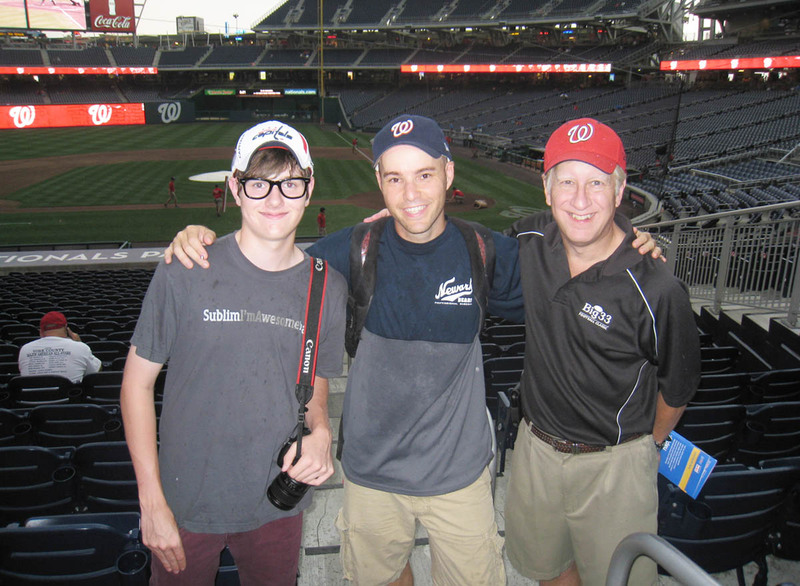 His name is Gregg Mace, and the young man on the left is his son Kyle. Despite not wearing a glove, Kyle ended up snagging a Brandon Phillips foul ball during the game. Very impressive. In the photo above, that’s Avi taking a photo of me. He decided to come along, just because. I got a double-cheeseburger, an order of fries, and a vanilla milkshake. 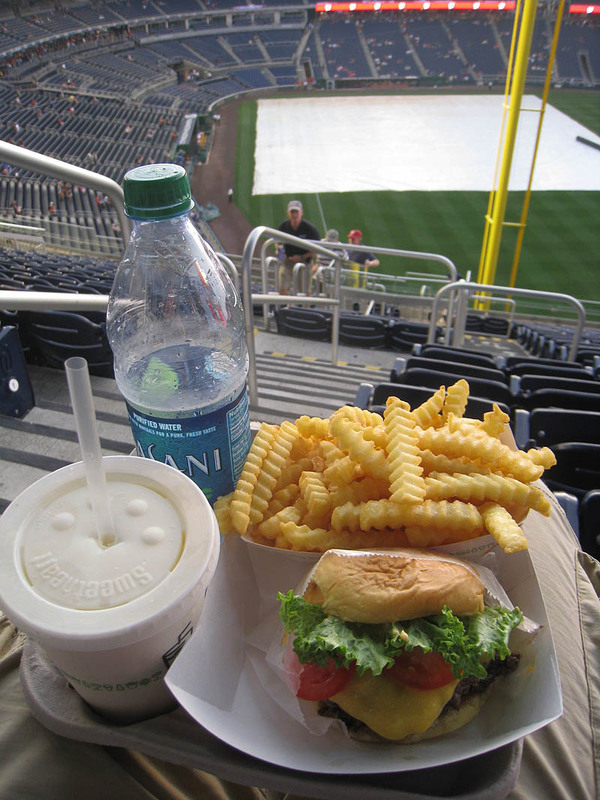 (And a bottle of water.) Not all that healthy. But hey, I shared my fries and shake with Avi, and of course I ate that insanely healthy Korean lunch, so it’s all good. I snagged two baseballs at the dugout AND a Joey Votto wristband. How effin’ awesome is that?! (Votto wears number 19.) 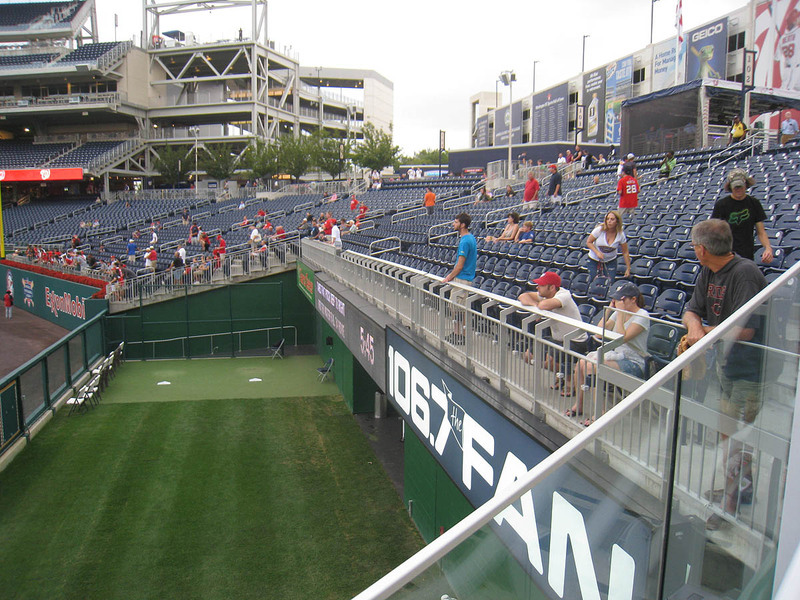 The second ball, pictured above on the right, was randomly tossed onto the dugout roof from below. I didn’t see who tossed it, and I didn’t even see it coming. 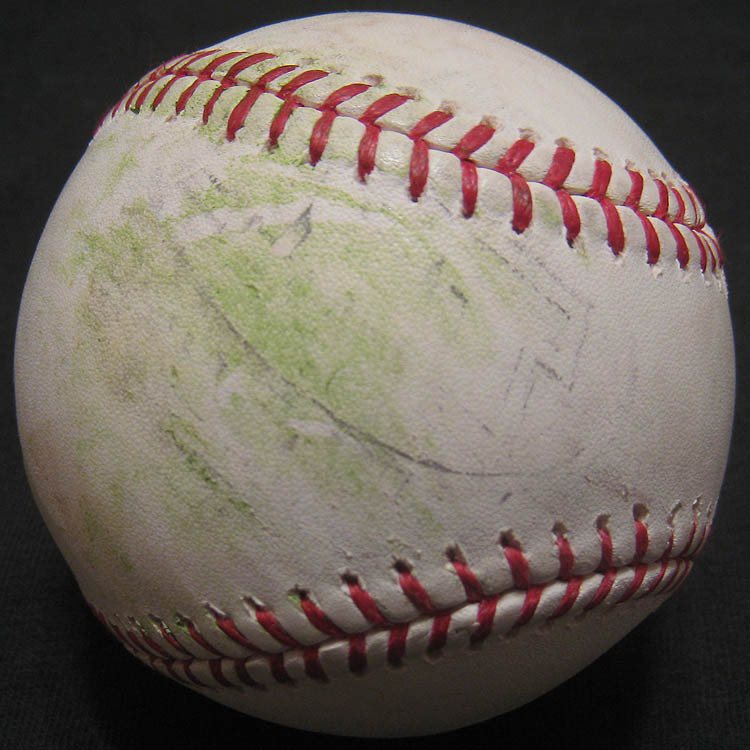 Another fan standing on my right (who already had a ball) said, “Hey, there’s a baseball,” and when I turned around and looked to my left, I saw it roll off the dugout roof and plop down into the empty front row. THAT was my 800th ball of the season. As for the wristband, I really didn’t do anything special to get it. For some reason, Votto was lingering near the top step of the dugout. I couldn’t see his hands, but it appeared that he was struggling to take something off. 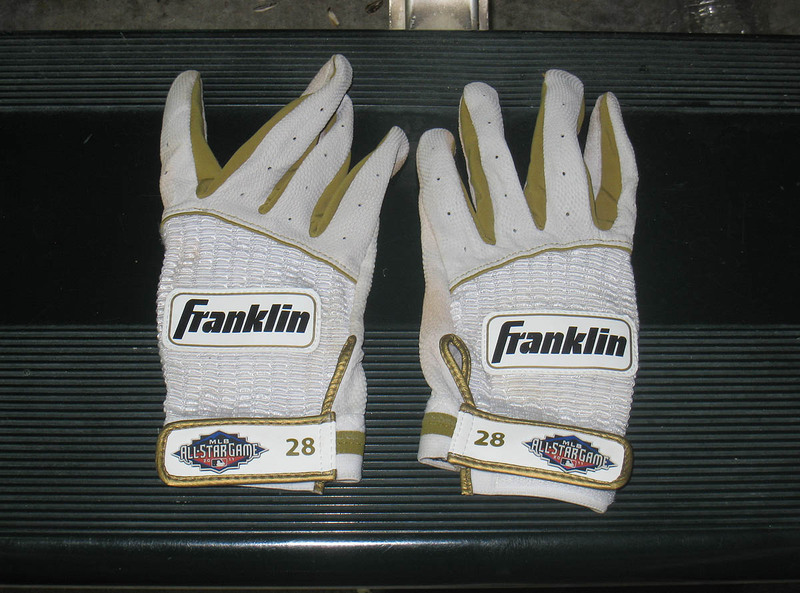 I assumed it was his batting gloves, so I asked for them. Moments later, something red came flying up from below, and I darted to my left to catch it. (There wasn’t anyone standing on my left, so it’s not like I robbed anyone. I just wanted to catch it before it hit the wet/dirty ground.) After I snagged it, it took me a moment to realize what it was, and as you can imagine, I was pretty excited. 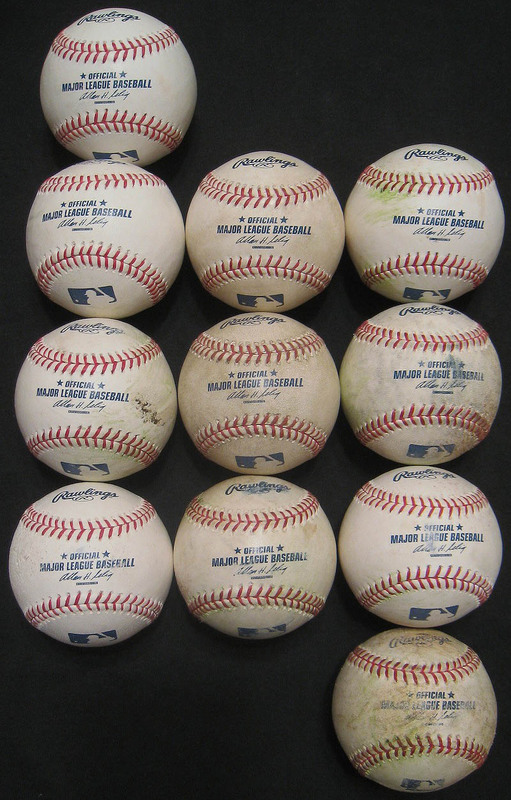 • 800 balls in 93 games this season = 8.6 balls per game. Want to see a few more photos? First, the “practice” logo is off-center. Second, the stitch holes are being tugged to shreds. 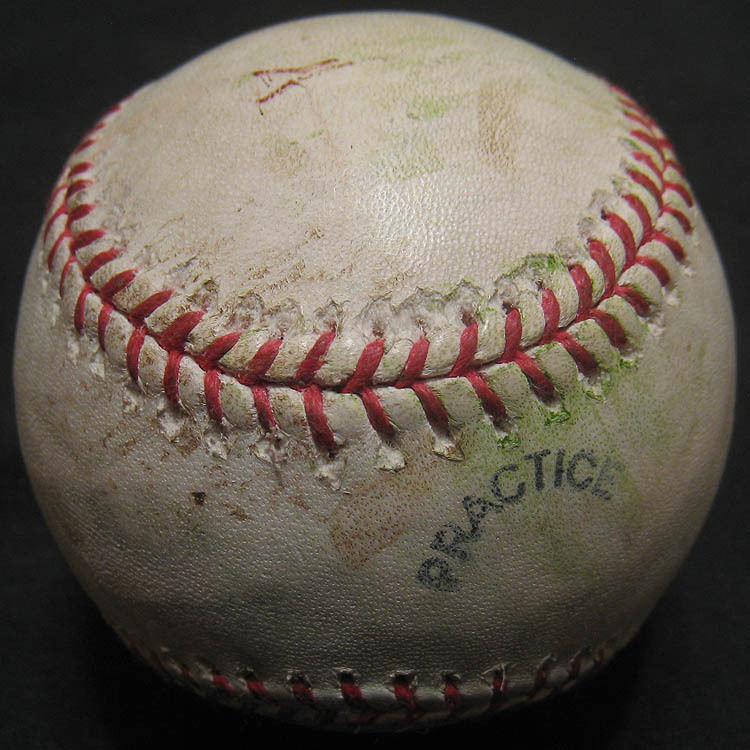 And third, there are two little crooked reddish brown lines on the ball (near the top of the photo). Those were there when I snagged it. Could they have been drawn on the ball by someone? I can’t imagine what might’ve caused such a bizarre marking. 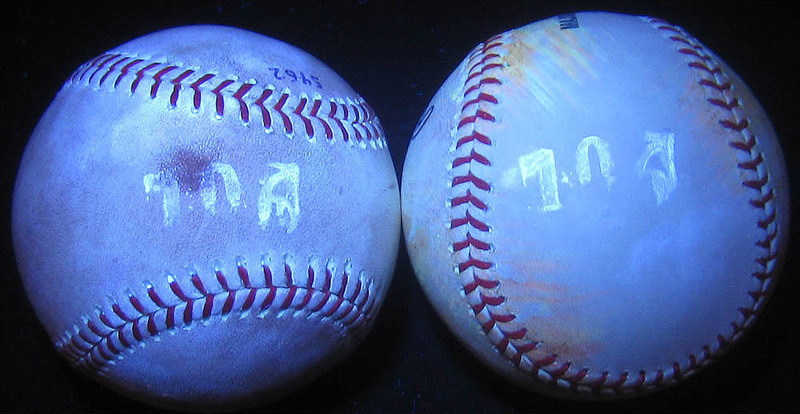 You’ve snagged a lot of inked baseballs over the years, do you have an opinion on which Rawlings stitcher is the best? Also, tough luck recently with running into a bunch of haters giving you grief for minding your own snagging business and “not giving the kids a chance.” You really should do something about that guard though. Those security guards/waitresses/tall a-holes should think about minding their own business. I always get a Concrete at Shake Shack. The bonus is if that’s all you’re getting, you go right up to the cold food line which usually has 2 people on it while the hot food line has 100. I see the Shack has branched off to the south, I’m hoping for north/east next. So, lets get this straight. 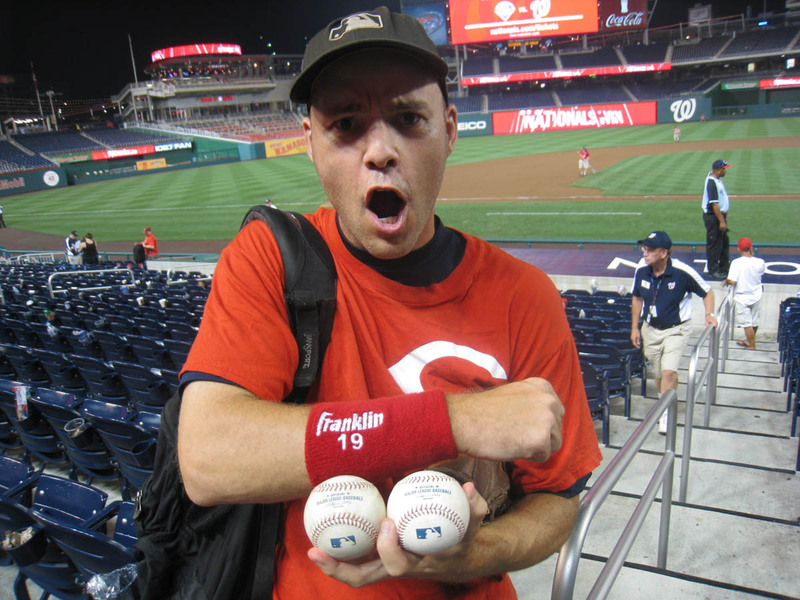 800 baseballs this year, 15 at this game, 3 games in a row with at least 15 balls, a Joey Votto wristband, and you saw some guy that you went to school with. That is insane. I admit, it is amazing to see Zack in action live. Its an experience that you MUST experience. BTW, I’m the kid who you said had “snagged at least 5 balls”. 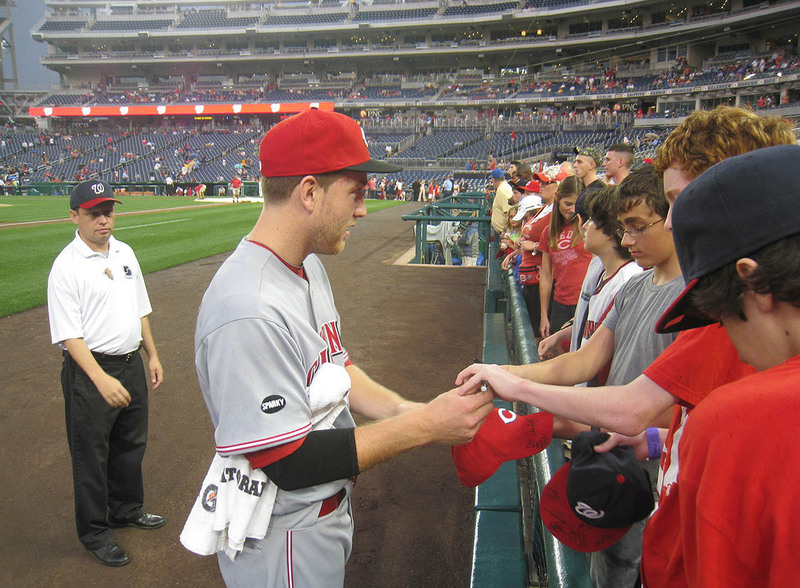 I ended up getting 12 and a Todd Frazier batting glove and an Ian Desmond signature. Oh and FYI, the “waitress/fake blonde” was actually the Red Porch restaurant supervisor. 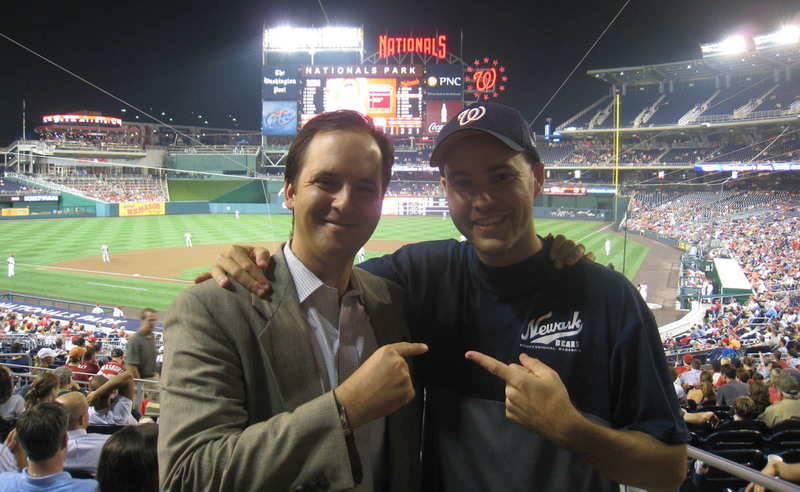 Zack, next year we are going either to Nationals park or camden yards! I got to see what it’s like! Love the wristband! Definitely one of the coolest items you’ve gotten. From an MVP!!! Out of all the things that I could possibly comment on in this blog entry, I will say this: they spelled your name wrong in that old class picture. 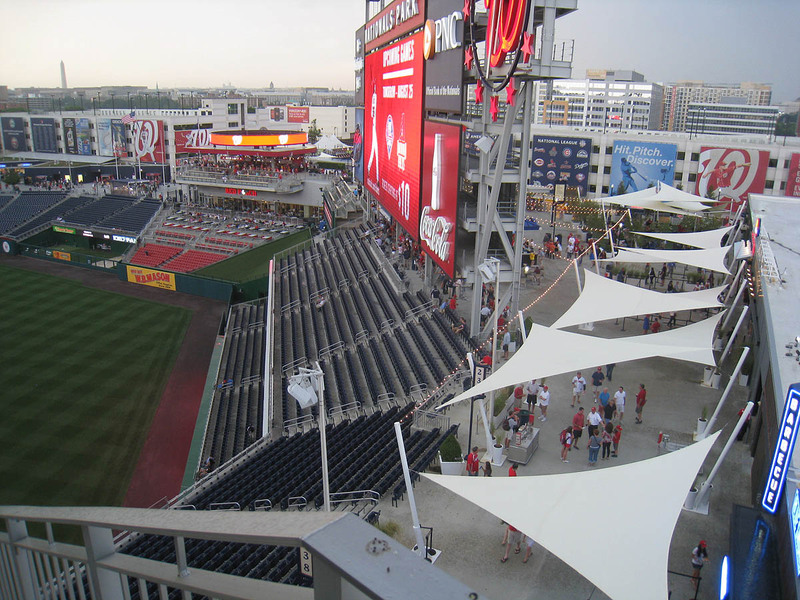 Also, Nationals Park seems like a near replica of Great American Ballpark. August 20, 2011 - 10:25 am Justin O. In the stands, how do you judge distance on a homerun Zack? It seems like 60% of the time I am camped out under the ball, it goes flying over my head and I look like a fool. August 20, 2011 - 9:29 pm Kyle K.
Nice pick up. I saw Votto throw his hat into the crowd after a game in Baltimore this year. There were a ton of Reds fans over the dugout, but he threw it to the people with a big Canadian flag. Might be something he commonly does ?!?! Haha, I think they’re all great. See my 8/19/11 entry. That’s why. It’s only great when no one shows up. But I suppose it should still be in the Top Ten. Actually, they didn’t. My first name IS Zachary, but I shorten it to Zack. A lifetime of practice, and I still make mistakes. I saw this comment of yours on a newer entry, so I answered you there. 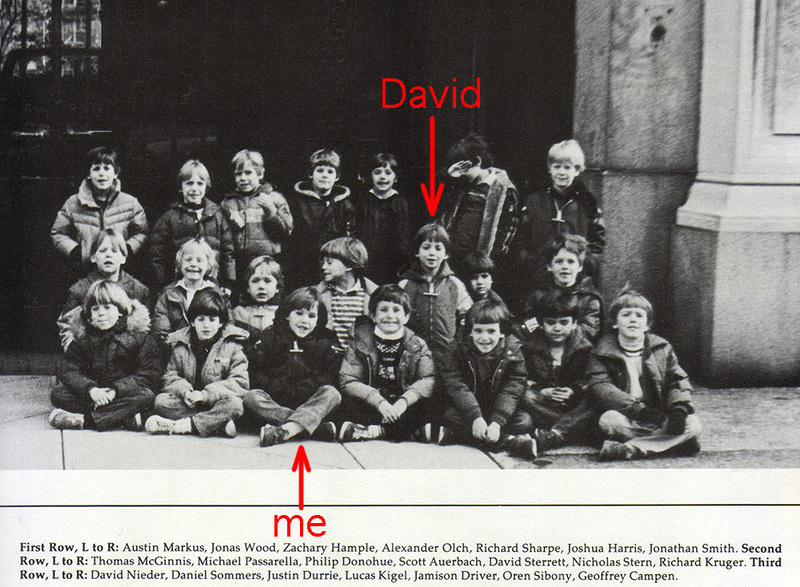 lol to that Oren Sibony kid in the back row of the 1st grade photo. Ha! Seriously. I don’t know what that was all about, but who understands six-year-olds anyway?